Industry thought leaders from the disciplines of the built environment, arts and culture will gather at Hassell Sydney Studio on 3 March for a panel discussion on Places people love: Arts & Built Environment, mediated by Katrina Strickland. In celebration of the newly opened Sydney exhibition celebrating his career of 25 years, Akira Isogawa will be interviewed in an In Conversation at the Powerhouse Museum on 4 March. The Festival will open on 1 March with a talk by prize-winning architect Ana Luisa Soares from Fala Atelier. Presented in partnership with School of Architecture, University of Queensland, Methodic Optimism: fala atelier will provide insight into the Portuguese studio’s intuitive and speculative architecture practice. Celebrate International Women’s Day on 8 March with a presentation by festival keynote speaker Rachel Wingfield of Loop.pH. As the co-founder of the London studio, Rachel Wingfield’s work explores the role of art and design in public spaces. This program is generously supported by the British Council. 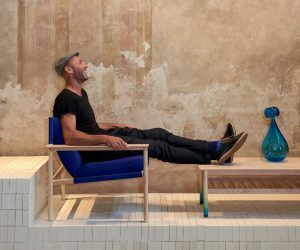 Furniture and lighting designer Duncan Meerding will share his creative practice and experience as a blind design practitioner in Alternative Sensory World: In Conversation with Duncan Meerding on 5 March at the Powerhouse Museum, presented in collaboration with Accessible Arts. Sibling Architecture tackles the issue of aged care and housing in New Agency: Owning Your Future. 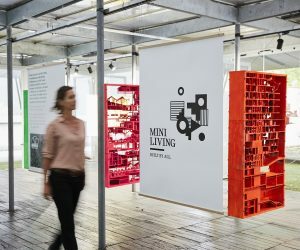 Supported by The School of Architecture, Design and Planning, The University of Sydney, this participatory research project will run daily throughout the festival at Tin Sheds Gallery. The role of design in issues of accessibility will be discussed at Inclusivity or exclusivity? The role of design in an ever-changing world, presented by Australian Graphic Design Association (AGDA) on 6 March at the Powerhouse Museum. The festival teams up with Sydney cinema favourite Golden Age Cinema to present the documentary cult classic Jiro Dreams of Sushi on 6 March. Where will our recycling go in the future, now that China has ceased the intake of Australia’s recycling? General Assembly poses solutions to this national issue in Design in Motion: Sustainable Solutions on 7 March at the Powerhouse Museum. How does a designer know when their work is finished? Is it ever finished? Join a panel of industry practitioners to discuss the challenges and rewards of life as a designer in I’ll Be Happy When on 7 March at Design By Them Showroom. Continuing the celebration of women in design, MAAS Indigenous Design Symposium runs at the Sydney Observatory from 9-10 March. Guest presenters will invite participants to learn about indigenous design practices 60 000 years in the making. Mid 20th-century design enthusiasts will gather at Rose Seidler House on 9 March for Seidler Screenings: Architecture, film and music presented by Sydney Living Museums, to view the Sydney premiere of Columbus – a new feature film about Modernist Architecture, love and house museums by Korean-American film-maker Kogonada. Parramatta Artist Studios will host a collective making event over lunch on 9 March when The Finishing School Writers Collective and WeAve Parramatta explore artistic patterns and finger knitting in The Long Table: Weaving Stories. During the festival Western Sydney University will launch T1-Commons, responding to demand for an online platform that connects creative practitioners in Western Sydney to share work, events and communities. Australian Design Centre will present a major exhibition of Australian artists, designers and architects working with steel in Steel: Art Design Architecture exhibition from 1 – 10 March. Exhibition After Technology at UTS Gallery explores the intersection of technology and art, featuring artists such as Patricia Piccinini, Julie Rrap and Grant Stevens. The Leo Kelly Blacktown Arts Centre will showcase the uniquely Tasmanian Aboriginal cultural practice of making rare and delicate shell necklaces throughout the festival in the exhibition kanalaritja: An Unbroken String. Addressing the issue of accessibility for audiences, University NSW Art & Design will present its exhibition Ideas Intersecting: Innovation and Design in the physical space of The Black Box but also online. Sydney-based American photographer Jon Setter will present his work in architectural and urban environments photography in Jon Setter: The Urban Text at Koskela from 2-10 March. The best design projects from 2018 HSC graduates will be on display at Shape 2018, opening at the Powerhouse Museum on 22 February and featuring inventions from the HSC subjects of Design and Technology, Textiles and Design and Industrial Technology. Design enthusiasts can use one of fifteen festival itineraries to get the most out of their festival. Itineraries are built around subject area with packages such as Women In Design, Indigenous Design, Shaping the Future, Design, Access and Inclusion and Go West catering to the interests of all festival-goers. MAAS Research Fellow Ollie Bown has drawn upon the Museum’s MasterTouch collection to create Spiral and the Mechanical Music Factory; a musical installation that reflects mechanical music history through modern music technology. This interactive installation will open on 1 March 2019 at the Powerhouse Museum. Now in its second year, MAAS Architecture Commission has awarded Perth and Berlin based architecture firm Penhale & Winter the prize for the design of the 2019 architecture installation. Agora will be on display on the forecourt of the Powerhouse Museum from 1 – 10 March.